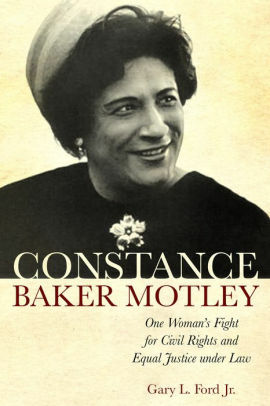 CHESTER — On Sunday, Nov. 19, at 4 p.m. at the Chester Museum at the Mill, the Historical Society will host a lecture and book signing by Dr. Gary Ford Jr, author of the just published book, Constance Baker Motley: One Woman’s Fight for Civil Rights and Equal Justice Under Law (University of Alabama Press). The event is free and open to the public. Dr. Ford, a professor of Africana Studies at CUNY’s Lehman College, with degrees from Harvard and Columbia Law School, will offer a treasure trove of exciting new facts, stories and unique insights into Motley’s unrecognized and under-represented contributions to the civil rights movement, and ultimately, her significance in American history. Between 1946 and 1964, she litigated and won over 200 desegregation and discrimination cases across 11 southern states at every court level, including the U.S. Supreme Court, where she became the first African American woman to argue a case. Ford argues in his book that Motley’s quiet courtroom battles were essential to the success of the street protests, sit-ins and marches because they turned those public campaigns for integration, equal rights and equal access, into codified American law. “This was Motley’s great, but little understood contribution to American history,” said Ford. Constance Baker Motley (1921-2005), a native of New Haven was a resident of Chester for 40 years, and had a seasonal home on Cedar Lake Road. She was an active member of the community, who involved herself in preserving local history. Her part-time residence in Chester coincided with her second career as a distinguished Federal Judge in the Federal District Court of NY, (1966-2005), appointed in 1966 as the first African American woman by Pres. Lyndon Johnson. She spent weekends, summer vacations and holidays in Chester. Prior to her Chester house purchase in 1965, Motley briefly entered public service (1964-1966), first as a state Senator from New York, and then as President of the Manhattan Borough Council, both firsts for an African American woman. Before that, she spent 20 years in the South as the chief litigator for the NAACP Legal Defense Fund arguing the most important desegregation cases that arose from the 1954 Brown vs Board of Education ruling that declared separate but equal unconstitutional. (See boxed civil rights history below). As an African American woman, Motley broke countless barriers and raised the glass ceiling for all women. Her path-breaking work was honored when she was inducted into the National and Connecticut Women’s Hall of Fame (1993 and 1998 respectively), and awarded the Presidential Citizen Medal of Honor (2001). Her autobiography, Equal Justice Under Law, (Giroux, 1998) has been in constant circulation. This past summer, the Chester Land Trust acquired her 8-acre property off Cedar Lake Road, and dedicated the land as the Constance Baker Motley Preserve to honor and commemorate her life. Since her death in 2005, the Chester Rotary has provided a summer scholarship in her name to a child from New Haven to attend Camp Hazen in Chester, one of the earliest integrated YMCA camps in Connecticut, financed by her own New Haven benefactor, Clarence Blakeslee, who supported her education at NYU and Columbia Univ. Last June, the Chester Historical Society, of which Judge Motley was a founding Trustee in 1970, mounted its first exhibit about her life at their Museum at the Mill. That exhibit will serve as the backdrop for Dr. Ford’s lecture and offer the last opportunity to view it before the Museum closes for the winter. The exhibit, also includes the celebrated documentary on her life (Justice is a Black Woman) produced by Dr. Ford and Quinnipiac University in 2012, and which airs annually on PBS. Ford’s popular video on Motley—Justice Is a Black Woman—produced at Quinnipiac University in 2012, and shown on PBS, will also be available as part of the Motley exhibit currently on view at the Museum.